It’s important to keep in mind that the economic differences within countries are huge. The height of the income mountains show the number of people on different incomes in $/day. Each country is a shape that spreads from low to high incomes with most people in the middle. When piling all the countries on top of each other, the world shapes looks like this. Pull the time-slider in this interactive graph back to 1975, and you will see a world that was divided in two. (Full screen version of the tool is here). 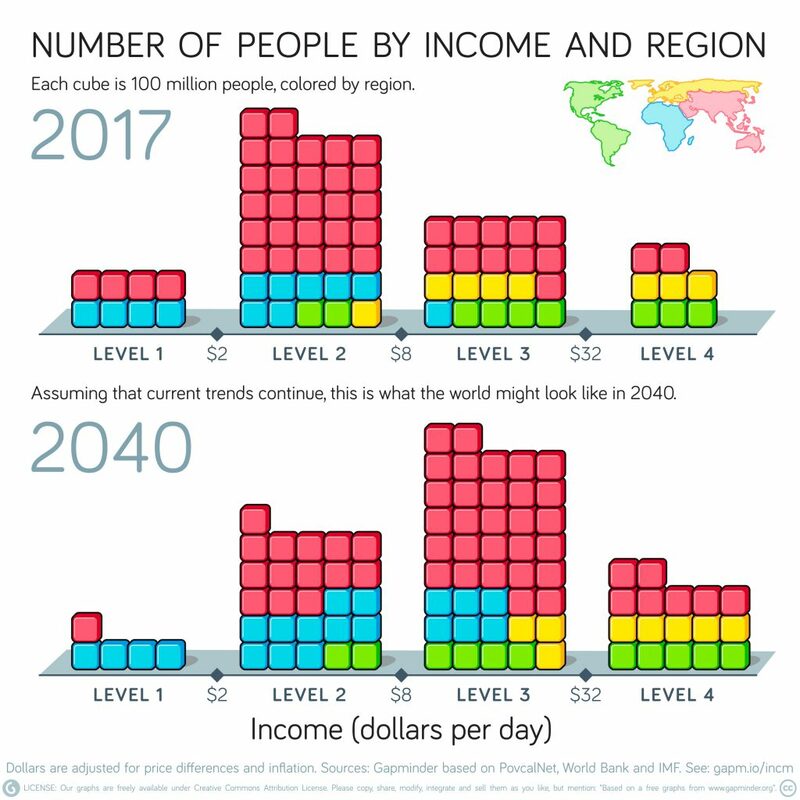 Scroll down for a video with Hans Rosling explaining the shape of income distribution. The tool above shows data from our dataset Income Mountain Data v1, which only reaches up to year 2015. We have a newer dataset, version 2, which is used for graphs in the book Factfulness. These datasets are far from precise, but they are consistent with graphs from multiple scientific papers published by different groups of economic researchers, as we explain in the data documentation here. We will soon update this page and the tool above. Stay tuned by following us on. Facebook or Twitter where we keep posting about all our updates. 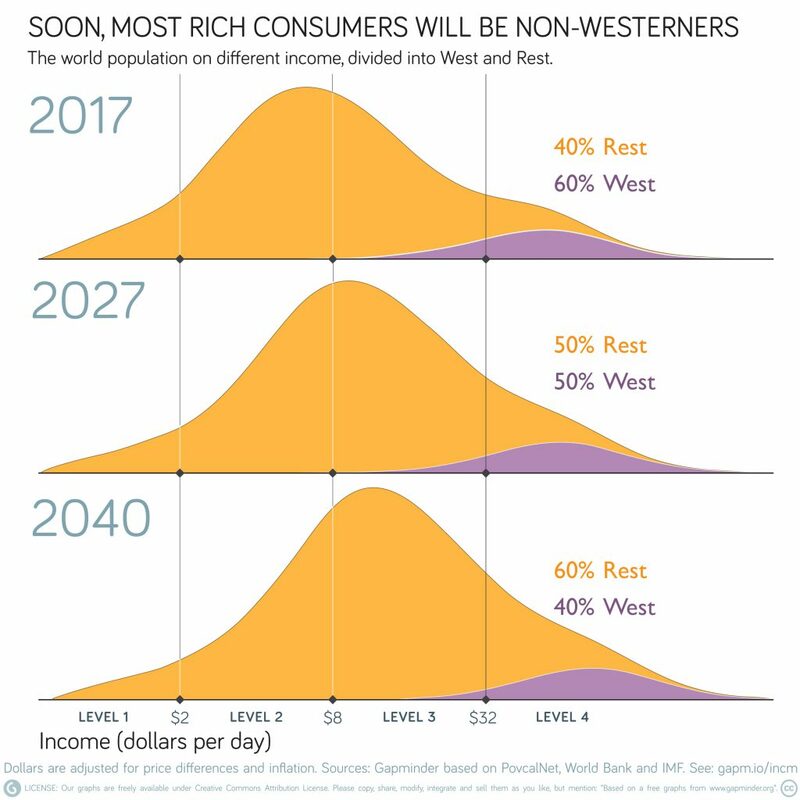 Professor Hans Rosling shows that people live in very different income levels. The poorest live in less than 1 dollar a day. Many people live with 10 dollars a day, while other live with 100 dollars a day. There are around 1 billion people in the world who live with less than 1 dollar per day. More than half of the world population lives with less than 10 dollars a day. And some people live with more than 100 dollars per day. There are huge differences in income between the richest and the poorest. Referring to this difference as a gap in income gives the impression that there are only extremely rich or extremely poor people. In reality, the majority of the world population lives in between.